1 Bedroom Flat For Sale in Yarm for Asking Price £90,000. 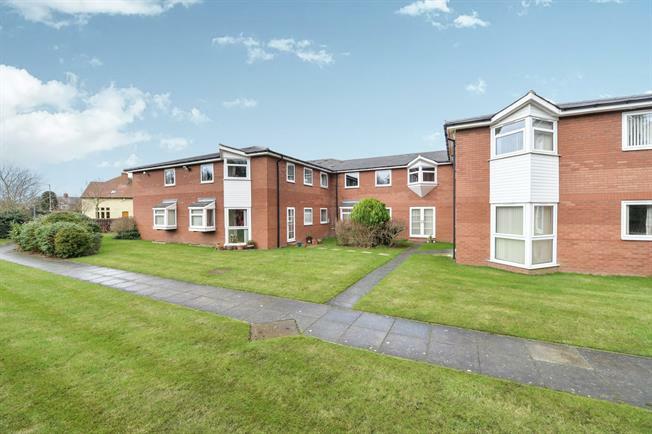 Rarely available, this over 55's first floor retirement apartment is presented immaculately, and offers well proportioned rooms comprising of a bright south facing lounge, well equipped kitchen, modern shower room, double bedroom and entrance hall. The development offers two communal lounges, a large conservatory and gardens for residents and guests to enjoy, as well as plenty of parking. Spacious entrance with two large storage cupboards. Storage radiator, smoke alarm and entry intercom system. Light, bright and a generous size, with two double glazed windows to the front aspect. Feature fireplace with marble hearth housing an electric fire, and storage radiator. Fitted with range of wall and base units with contrasting work surfaces incorporating a one and a half bowl sink and drainer unit. Electric cooker point with extractor hood over. Space and plumbing for a washing machine and fridge freezer. Part tiled walls and vinyl flooring. Double glazed window to front. Range of fitted wardrobes and storage radiator. Wash hand basin set into a vanity unit with storage. Contemporary 3 piece suite with double shower cubicle, WC and pedestal wash hand basin. Heated towel rail and extractor fan. The building offers several informal seating areas for residents and guests to enjoy, located on the first floor, and enjoying panoramic views of the gardens. There is also a sunny conservatory. Gardens surround the apartment to three sides. Mainly laid to lawn, with a variety of mature tress and shrubs providing colour and interest throughout the year. Parking is provided at the front for residents and guests.